Our enchanting guide, in the tiny visitor’s center. I have wanted to visit this distillery ever since I came upon this photograph on the web. With those big windows looking onto the water, the facility struck me as a particularly attractive still house. Being my wife’s favorite single malt, it became a primary destination for our Islay visit. Caol Isla, a big distillery, is owned by Diageo, a massive multinational. You might expect an experience like we had at Glenmorangie: scripted, restricted, slick but shallow. Well, nothing like that on the shores of the Sound of Islay. We had a fun and altogether rewarding tour, especially the tasting—the Caol Ila Cask Strength Experience. Highly recommended! Sadly, as with the Glenmorangie folks, no photographs were allowed inside. Too many lawyers with these big firms. However, our guide was a really lively, fun local lady, Hazel, who invigorated the experience with wit and panache. So, a little background. Caol Isla, a few miles north of Port Askaig on Islay, founded 1846, rebuilt in 1972, has a capacity of 6.5 M liters a year (though they produce about 4.5M L), powered by six stills and ten washbacks (the last two installed in a 2011 expansion). That’s a lot of malt, and represents the biggest output of any distillery on the island. Which is a little odd considering what an acquired taste is their single malt. Where does it all go? Into Diageo blends (Johnnie Walker according to Hazel). The Paps of Jura. Across the sound. The tour started in the tiny visitor’s center, basically a converted office from the look of it, with a selection of t-shirts, sweatshirts, jackets and some limited-release malts. Really kind of homey and low-key. We were joined by just one other couple (whom we had seen at Bunnahabhain earlier). Our way wound up the usual path of ladders, white-painted halls and through imposing-looking fire doors. We saw a 1960s Porteus mill still in fine shape and we did get to walk through the lovely still house, though the sun was not in evidence. Hazel provided a ton of information and since I don’t have photos (you can see some here), I have some statistics instead, courtesy of Hazel’s encyclopedic brain. Caol Isla usually creates a peated whisky; at 36 ppm it is about the same as Lagavulin, but they strive for a lighter flavor. How the lighter flavor is effected was the subject of Hazel’s very detailed discourse over the next forty minutes. When we visited in 2017, they were running at a consumption of 200 tons of barley per week, though they can do up to 235 tons, putting them in the top 10 of (pot still) distilleries in Scotland. 12.5 tons make up a batch, which they soak in a stainless steel Abercrombie mash tun (new in 2011). They run the first water at 63.5° C, run sprinklers for an hour bringing it successively to 69°C and 85°C. The result is a 58K liter batch. This goes into their pine washbacks, 8 of which are from the 1972 build, in the main building, with two more added in 2011. To the 58KL of wash is added 300 liters of yeast for the fermentation, which, with the help of CO2 extraction runs a minimum of 30 hours, up to 60 hours depending on weather, though some spirits are fermented as long as 100 hours. The result is a wash of 8-9% strength. Into the three wash stills with that, at 20K liters per still, yielding a low wine of 20-25% after first distillation. The three spirit stills are up next. 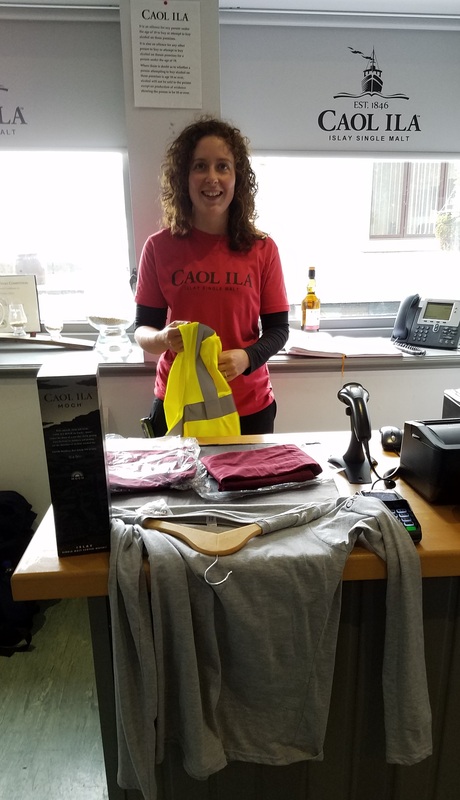 After 15-20 minutes the foreshot is cut out and the spirit is captured at 75% down to 65% alcohol, netting an average if 70-71% strength spirit, “stronger than most” asserted Hazel and I am sure that is part of Caol Isla’s particular expression. I find the Caol Isla 12 medicinal, though in a different way from Talisker, another famously medicinal Island malt. Their feints start at 65% and go back for a re-run with the next fill. More Caol Isla magic: they take a smaller, higher mid-cut than most whiskies, starting their run at a higher percentage of alcohol, leaving behind some of the heavier congeners that might go into other whiskies. They also run their stills at 50% of their capacity, meaning more copper is exposed to the vapors, again getting a lighter spirit. When the wash is down to 1% alcohol, it is done in the still. The malt master uses second-fill ex-Bourbon barrels for aging the main releases; first-fill bourbon is used for the Distiller’s edition and other special releases. 3500 barrels are aged onsite on Islay at the distillery, the rest age on the mainland. That’s the facts. Next post, I’ll write up our exceptional Cask Experience. 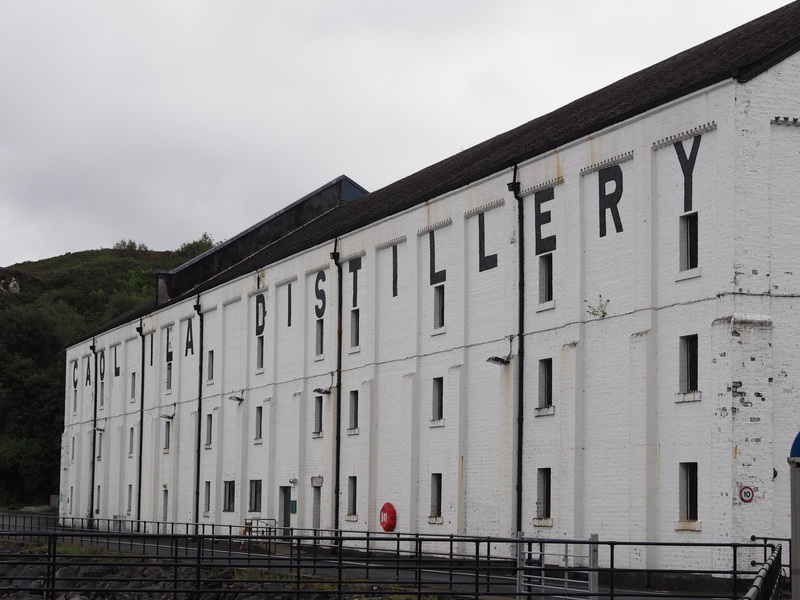 This entry was posted in Distillery Tour, Whisky and tagged Caol Isla, Distillery Tour, Scotch whisky. Bookmark the permalink.